Poké Problem (Japanese: ポケもんだい Pokémondai) is a question-and-answer segment in the anime's Sun & Moon series, replacing Poké TV of the XY&Z arc of the XY series. As opposed to previous segments of this format, the Poké Problem is presented in two parts; the question at the very beginning of the episode, before the cold opening, and the answer at the very end, after the credits. Introduced in SM003, each Poké Problem is typically hosted by a student or staff member of the Pokémon School, or at other times, another main or recurring character, who presents the question and reminds the viewer to stay tuned to find out the answer. The question relates to a highlight or fact revealed in the episode itself. Sometimes, the host or hostess reads the answers and their corresponding colors aloud as well. At the end of the episode, the host reveals the answer and reviews it. Like in Poké TV, an extra scene will play after the review. SM004 Mallow "In today's episode, which of these Pokémon will Ash catch?" SM005 Lana "What type is the cutie pie known as Popplio?" SM007 Professor Kukui "In today's episode, which Pokémon will Ash try to catch?" SM008 Lillie "Which Pokémon comes to visit at my house?" SM009 Ash "What's the natural enemy of the Rattata who will appear in today's episode?" SM010 Hala "What do you get if you pass my grand trial?" SM012 James "What Pokémon will become a companion of Team Rocket in this episode?" SM013 Samson Oak "What Pokémon do you think will win the Pokémon Pancake Race?" SM015 Professor Kukui "Which new Pokémon will Ash catch in today's episode?" SM016 Meowth "Which of these is the detestable Pokémon that gets in our way in today's episode?" SM018 Mallow "Which of these Oricorio will drink from the Yellow Nectar?" SM020 Ash "Which Pokémon attempts to steal Ash's backpack in today's episode?" SM022 Kiawe "What Pokémon evolves in today's episode?" SM023 Sophocles "Which Pokémon admires the Dugtrio in today's episode?" SM025 James "What Totem Pokémon will appear in today's episode?" SM029 Lana "Which Pokémon scares us in today's episode?" SM030 Lillie "Which partner Pokémon do I take care of in today's episode? SM032 Ash "What Pokemon will I attempt to catch in today's episode?" SM034 Kiawe "What Pokemon does Turtonator fight in this episode?" SM035 Mallow "What is the Totem Pokémon that appears in today's episode?" SM036 Professor Kukui "Which Pokémon does Olivia out to battle along with Lycanroc in today's episode?" SM037 Professor Kukui "Which Pokémon evolves in today's episode?" SM038 Jessie "Which Pokémon takes my malasadas in this episode?" Nurse Joy "Which Pokémon does Mallow come across in the forest?" SM040 Lana "What is the Pokémon that becomes Popplio's teacher?" SM043 Ash "Which Pokémon will Pikachu fight in today's episode?" SM046 Kiawe "Which Pokémon causes trouble in today's episode?" SM049 James "Which one of these Pokémon does old man Faba use in today's episode?" SM052 Meowth "Protokoffing evolves in today's episode! What does it become?" SM056 Sophocles "Which one of these Pokémon becomes Komala's greatest rival in today's episode?" SM061 Rotom "Which of these Balls is used to catch Ultra Beasts in today's episode?" SM062 Meowth "My rival appears in this episode. Who is it?" SM063 Ash "Who's the Masked Royal's partner Pokémon in today's episode?" Nurse Joy "The Passimian of Melemele Island feature in today's episode. What is their team name?" SM065 Lillie "Which of these is the Pokémon that Ilima has with him, featuring in today's episode?" Nurse Joy "Which of these Pokémon helps me in today's episode?" SM070 Kiawe "What Pokémon does the Officer Jenny featured in today's episode have as a partner?" SM071 Professor Kukui "Which of these Pokémon takes a shine to Lana in today episode?" SM072 Mallow "Which of these Pokémon is my brother's partner, and is featured in today's episode?" SM073 Jessie "The Pokémon that steals our Darkinium Z in today's episode…?" SM074 Ash "The Pokémon the Island Kahuna sends out in today's episode is...?" SM075 Rotom "What Pokémon does Lycanroc battle in today's episode?" SM076 James "Which one of Team Rocket's Pokemon uses a Z-Move in today's episode?" SM077 Ash "Which one of these is the final Pokémon Nanu sends out in today's episode?" SM080 Lillie "Which of these Pokémon do we help in today's episode?" SM084 Ash "Who is the Pokémon that understands Poipole's feelings in today's episode?" SM086 Mallow "Which one sees my Ride Pokémon Flygon as a rival in today's episode?" SM087 Lillie "Which Pokémon comes out of an Ultra Wormhole in today's episode?" SM089 Rotom "One of Poipole's kind appears in today's episiode. Which one is it?" SM090 Professor Burnet "The Pokémon that we call the "Blinding One" is...?" SM095 Kiawe "What is the evolved form of the Alolan Graveler that appeared in today's episode?" SM096 Jessie "The Pokémon that grabs on to me in today's episode is...?" SM097 Ash "What is Hau's partner Pokémon that appears today?" SM099 Lana "Who is the Pokémon that Popplio helps in today's episode?" SM100 Ash "A rare Pokémon appears in today's episode. What is it?" SM101 Ash "What "king" Pokémon do we battle in today's episode?" SM102 Lana "What Ride Pokémon do we ride in today's episode?" SM103 Kiawe "What is the wild Pokémon that came to our ranch in today's episode?" SM106 Sophocles "Which of these Pokémon will evolve from Charjabug in today's episode?" SM107 Kiawe "Which one do I battle in today's episode?" SM109 Ash "Which Pokémon do I use in Hapu's grand trial in today's episode?" SM112 Professor Burnet "The type of the new Pokémon in today's episode is...?" SM114 Hala "Which Ultra Beast appears in today's episode?" SM116 Lillie "Which one of these do I meet in today's episode?" In SM003, all the provided choices are all electronics Rotom are known to inhabit. The first airings of episodes with promotions, one-hour specials, and episodes that are being shown during the promotion of the movie specials do not include this segment for that episode. However, these segments were included in airings on other stations that aired the episode in delay, reruns on cable networks such as Kids Station, and VOD services (such as Amazon Video and Hulu). Viewers could answer the Poké Problem with their remotes during the airing of SM003 and SM004, which aired as a one-hour special, to take part in a lottery of five Pokémon Z-Ring and Z-Crystal Special Sets. 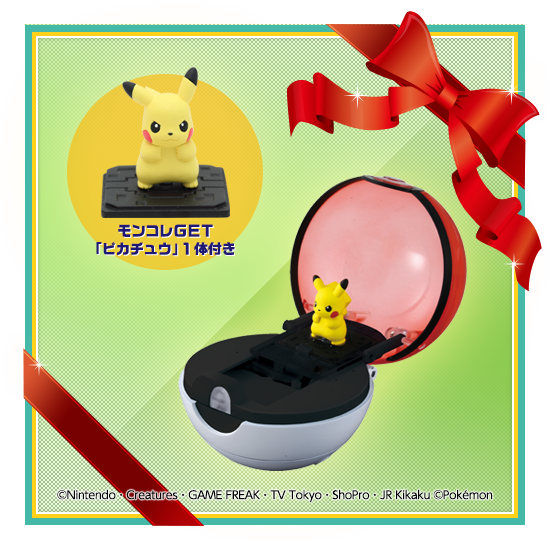 During the airing of SM009 viewers could take part in a lottery of ten MonCollé GET Monster Balls Filled With Voices and MonCollé GET Pikachu figures. In SM099, the beginning of the problem shows Sandy in its original hairstyle, and after the end of the episode, it changes to the new hairstyle given to it by Lana. In SM100, Ash doesn't give much information on Zeraora, due to the fact that in the episode, he has become separated from Rotom. In SM101, the Magikarp shown was one of the options in the Poké Problem is animated as flopping about. In SM107 and SM109, the options that are shown as options have a colored background representing the options of their specific color. In addition, in the former episode, the guardian deities are shown inside their shells at the start of the episode, while at the end of the episode, three of them are seen out of their shells. In SM111, the final option for the question in is a pun on Kakigōri, a Japanese desert, with Kiawe's Japanese name being used in place of the hiragana characters for "Kaki". In SM116, all the provided choices are Mythical Pokémon that starred in movies in the XY series.